Switzerland’s Ecole Polytechnique Fédérale de Lausanne chemists have developed a method that can significantly increase the yield of sugars from plants, improving the production of renewable fuels, chemicals, and other materials. Producing fuels and chemicals from biomass (wood, grasses, etc.) is one of the most promising solutions for building a renewable economy. The process involves breaking down, or “deconstructing,” plants to produce single carbohydrates, mostly in the form of simple sugars like xylose and glucose. These sugars are valuable. But current processes for plant deconstruction often end up degrading them. Beech wood undergoing deconstruction to yield sugars. Image Credit: Ydna Questell-Santiago, EPFL Laboratory of Sustainable and Catalytic Processing. Click image for the largest view. The lab of Jeremy Luterbacher at EPFL has developed a chemical method that stabilizes simple sugars and prevents them from being degraded. 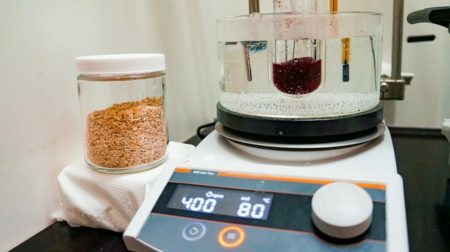 This new method could mean that chemists no longer have to balance deconstruction of the plant with avoiding degradation of the product. The team’s research paper has been published in the journal Nature Chemistry. The chemists tried their method on beechwood, First, they turned it into pulp using a paper-making technique called organosolv, which solubilizes wood into acetone or ethanol. But in order to latch aldehydes onto the sugars, the scientists mixed the beechwood with formaldehyde. With this approach, they were able to recover over 90% of xylose sugars as opposed to only 16% xylose without formaldehyde. When they broke down the remaining pulp to glucose, the carbohydrate yield was over 70%, compared to 28% without formaldehyde. These are huge improvements! More than double in fact. Organosolv is a very effective disintegration process. There are very likely many other products that can have their sugars ‘refound’ allowing a great deal more recycling as well as many more wastes and surpluses finding value. This may well be a break through. If we get more information, that would be great.